The Watchtower joined the UN for 10 years in secret! On the 9th October 2001, as a result of it becoming widely known that the Watchtower had been riding the beast for nearly 10 years, the Watchtower terminated its association with the UN. But just because the woman gets off the Beast does not mean she has stopped being a Harlot. The evidence that we currently have points to the Watchtower being granted association on January 28th 1992 along with 36 other NGOs. 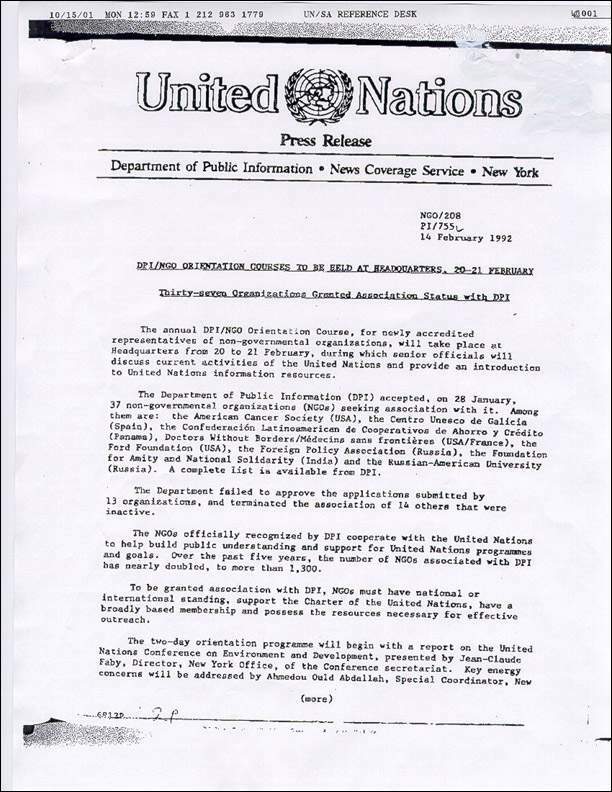 There is a UN press release NGO/208 PI/755 which we were relying on for the date of their association back in 2001. And next to it in the confirmation of the timelines form the UN given in 2004. 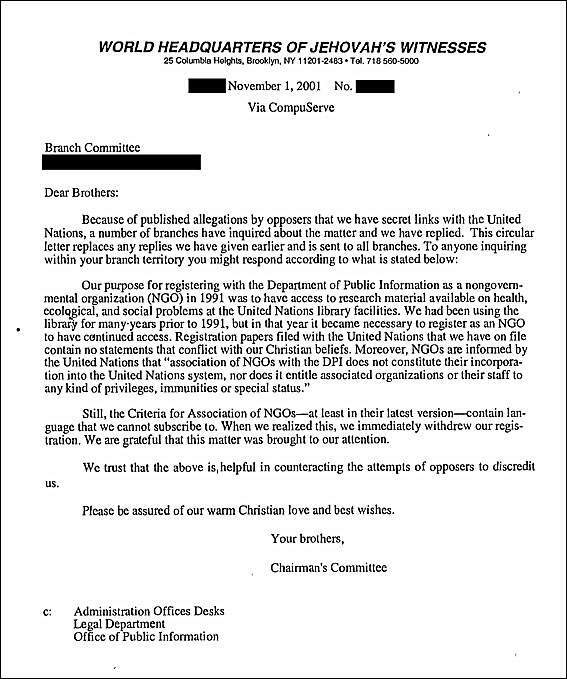 Here is a link to the UN letter of 2004 detailing the timeline of the Watchtower's association with the UN. The Watchtower Society had become affiliated with the UNITED NATIONS, as an NGO (non Governmental organization) in 1992. On 9 October 2001, this affiliation was terminated, when this information had started to become public. However, just because the woman gets off the Beast does not mean she has stopped being a Harlot. See Revelation, Chapter 17, below for what the Bible says on the Harlot riding the Wild Beast. 2 with whom the kings of the earth committed fornication, and the ones inhabiting the earth became drunk from the wine of her fornication. 3 And he carried me away into a desert, by the Spirit. And I saw a woman sitting on a scarlet beast, filled with names of blasphemy, having seven heads and ten horns. 4 And the woman was clothed in purple and scarlet, and being gilded with gold and precious stone and pearls, having a golden cup in her hand, filled with abominations and unclean things of her fornication. 5 And on her forehead was a name having been written: Mystery, Babylon the Great, the Mother of the Harlots and of the Abominations of the Earth. 6 And I saw the woman being drunk from the blood of the saints, and from the blood of the witnesses of Jesus. And I marveled, seeing her, with a great marveling (The literal translation of the Holy bible). By doing an Internet search for “Watchtower Society” and other related terms, including the United Nations, the information following was found. This can be done on either http://www.google.com or http://www.alltheweb.com, or other good search engines. 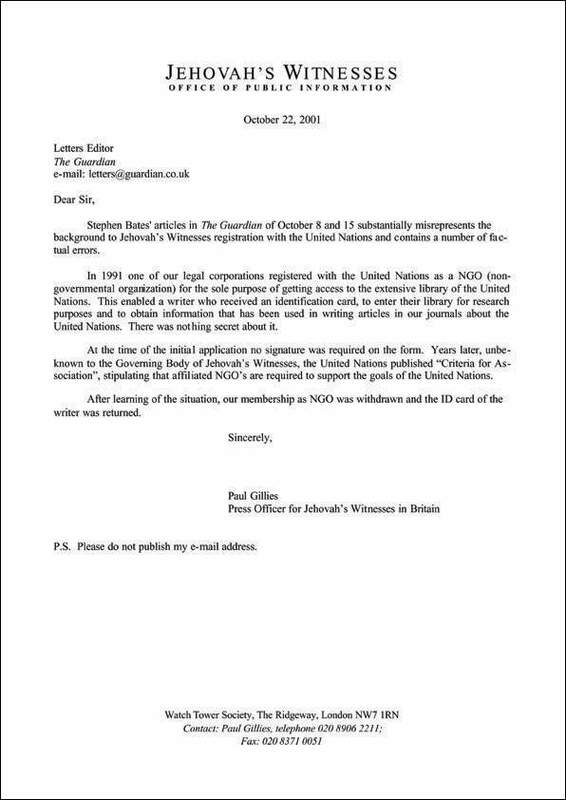 The writer of this article was trying to prove to herself that the WTS had NOT actually joined the UN, as an NGO. Nevertheless, up on the net are several sites, that the WTS does actually admit that they joined the UN. They are using the excuse that they used it like a "library card," so that they could cross the East River there at Brooklyn (there are the 2 big bridges there by the WTS's landholdings: The Brooklyn Bridge and the Manhattan Bridge) to the other side of the River, where sits the UN Building in New York, and actually use their extensive library. They claim they didn't know what that amounted to, the joining. They did know. They are lying. I read about a month ago on the UN site, what one has to do to join the UN. They have to supply to the UN on a regular basis what their organization is doing, they have to agree to "doing a commercial" for the UN, in other words, get others to recognize the "good works" of the UN. Someone talked to a person at the UN, and said what the position of the WTS had always been, that the UN is the image of the scarlet colored Wild Beast in Revelation, it takes false worship, and that the WTS condemns it. The spokesman was baffled and didn't understand then why the WTS would join up. Well, neither does anyone else! The WTS said it did not do this behind anyone's back. But just how many of the publishers in the WTS knew about this in 1992? They will call this lies being spread, and most will not even try to look into whether the accusations are true or not, because the Governing Body is looked to the same as the Pope is looked to, as being infallible. The finely dressed prostitute that rides on the back of the Scarlet Colored Wild Beast of Revelation 17, (riding for the years between 1992, and 9 October 2001, when she disassociated herself only because people were finding about the association of the WTS and the UN,) was the Watchtower. This association may be also the thing in Daniel 8/11/12 as the “abomination causing desolations." 5 because her sins joined together, even up to Heaven, and God remembered her unjust deeds. 6 Give back to her as also she gave back to you, and double to her double, according to her works. In the cup which she mixed, mix to her double. 7 By what things she glorified herself, and luxuriated, by so much give back to her torment and mourning. Because she says in her heart, I sit as a queen, and I am not a widow; and I do not see mourning at all. 8 Because of this, in one day her plagues shall come: death, and mourning, and famine; and she will be consumed with fire, for the Lord God judging her is strong. 10 standing from afar because of the fear of her torment, saying, Woe! Woe to the great city, Babylon, the strong city! For in one hour your judgment came. 13 and cinnamon, and incenses, and ointment, and frankincense, and wine, and oil, and fine meal, and wheat, and beasts, and sheep, and horses, and chariots, and of bodies and souls of men. But the duties and obligation of the Watchtower under their ludicrous agreement with the UN which Satan was so happy to see signed were as stated in the present letter that the UN is sending out on the matter as it has been absolutely swamped with requests fro information by rank and file JWs. If you have any doubt about God's view on his people having agreements to support third parties then please peruse the following 8 scriptures. 11 Phinehas­ the son of Eleazar the son of Aaron the priest has turned back my wrath from upon the sons of Israel by his tolerating no rivalry at all toward me in the midst of them so that I have not exterminated the sons of Israel in my insistence on exclusive devotion (Number 25:11). 24 For Jehovah your God is a consuming fire,­ a God exacting exclusive devotion (Deuteronomy 4:24). 9 You must not bow down to them or be led to serve them, because I Jehovah your God am a God exacting exclusive devotion, bringing punishment for the error of fathers upon sons and upon the 3rd generation and upon the 4th generation, in the case of those who hate me (Deuteronomy 5:9). 15 (for Jehovah your God in your midst is a God exacting exclusive devotion) for fear the anger of Jehovah your God may blaze against you and he must annihilate you from off the surface of the ground (Deuteronomy 6:15). 19 Then Joshua said to the people: You are not able to serve Jehovah, for he is a holy God; he is a God exacting exclusive devotion. He will not pardon your revolting and your sins (Joshua 24:19). 13 And my anger will certainly come to its finish­ and I will appease my rage on them and comfort myself; and they will have to know that I myself, Jehovah, have spoken in my insistence on exclusive devotion, when I bring my rage to its finish upon them (Ezekiel 5:13). 2 Jehovah is a God exacting exclusive devotion and taking vengeance; Jehovah is taking vengeance and is disposed to rage. Jehovah is taking vengeance against his adversaries, and he is resentful toward his enemies (Nahum 1:2). The writer remembers attending the circuit assembly around 1993 called the exclusive devotion circuit assembly or the likes. Throughout the whole assembly the Watchtower was devoted to both God and the UN. The first commandment was: Thou shalt have no other God's before my face. Idolatry is the greatest sin since it is a failing to show love or even respect to God. Every building owned by the Watchtower is dedicated to God. Every baptised JW is dedicated to serve God. Dedication means an exclusive service to God. 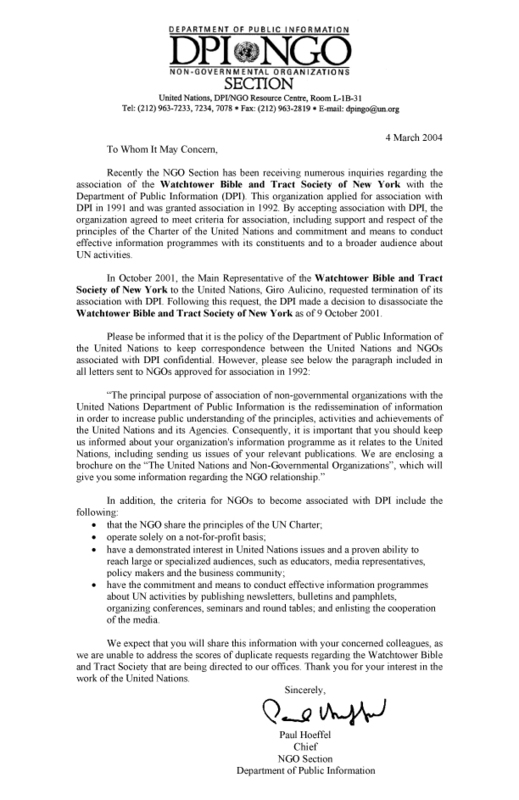 For the Watchtower to make an agreement that they will promote and support and advertise the UN and its charter in circumstances where they and all of their assets are not merely covenanted but actually dedicated to be used exclusively to serve God alone and to promote support and advertise his Kingdom alone is gross hypocrisy, gross idolatry and is spiritual harlotry. The ideals of the UN charter are noble ideals, but that is because the UN is Satan's final counterfeit of the Kingdom of God, designed to divert attention from the real Kingdom of God. This counterfeit will kill millions of people. It will not achieve it's noble ideals, in fact it will become corrupt and achieve the very opposite of its ideals, because a worldwide political monopoly is the most dangerous thing on this earth for human life which is why God split all the languages up at Babel. It will prove to be even more dangerous than terrorism which it is empowered to destroy! It should remain a humanitarian and human rights and human security organization. It should be a judge of the world and a service to mankind, but no, it will become our master. It will become a King over mankind. In fact it already is a King over Afghanistan through the vassal Hamid Karzai. It is already the 8th biblical king of the World. For the scriptures which prophecy that the Watchtower will join the UN in secret, and which prophecy the very day that the UN accepted them as an associated NGO, and which prophecy how long they will be riding the beast for, and under what circumstance, and which show that this agreement is the transgression that causes desolation - see .